Many state car seat laws are way behind the times concerning safety. Florida, for example, doesn't require car seats for preschool age children. 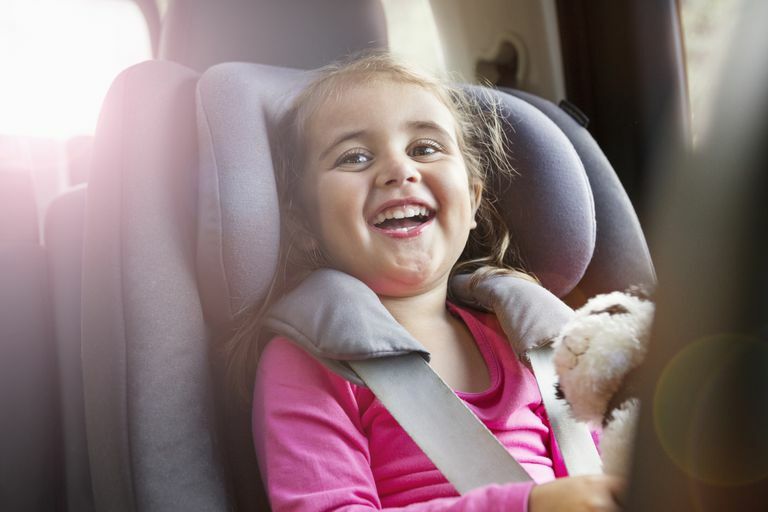 Simply following your state's car seat laws might not get you a ticket, but it won't be the best protection for your child if you are in a car accident. To make it even easier, remember that seat belts don't fit properly until the lap belt lays across your child's upper thighs (not his stomach) and the shoulder belt fits across his chest (not his neck). If you need some convincing about how important this is, consider that in car seat use reduces the risk of death for infants in an automobile accident by 71% and to toddlers aged 1-4 years by 54%, according to the Centers for Disease Control and Prevention. Booster seat use, compared with using seat belts alone, reduces the risk of serious injury by 45% for children aged 4-8 years. In 2013, more than 127,250 children aged 12 and younger were injured in motor vehicle crashes and 638 died. Of those who died, 38% were not buckled up. Although state car seat laws have been getting better recently at keeping up with expert safety recommendations, two states, Florida, and South Dakota, still don't have booster seat laws for kids who have outgrown car seats. And many of the states that do have ages set well below what experts think is safe. No matter what your state laws are, after your child outgrows his forward-facing car seat with harness straps, be sure to graduate to a belt-positioning booster seat, instead of simply going to seat belts. It can sometimes be hard to convince school age children about the importance of using a booster seat, especially if many of their friends are already just in seat belts. To help him get on board with using a booster, it can help to be firm about his sitting in a booster seat and use it all of the time. Make using a booster seat one of the non-negotiable rules of your household and don't give it on the issue. Don't refer to it as a car seat or baby seat and, instead, use the terms booster seat, big boy/girl seat, or just safety seat. If your car's back seat has headrests, consider using a backless booster, which to many kids doesn't look like a 'real' car seat. Talk about the benefits of sitting in a booster, which besides safety include being able to look out the window, having cup holders, and being more comfortable with the arm rests, etc. NHTSA. Car Seat Recommendations for Children. Child Passenger Safety: Get the Facts, Centers for Disease Control and Prevention, updated February 8, 2016.